Last summer a friend of mine told me that she had to throw away tons of her clothes after she’d discovered a moth infestation. Can you imagine? Now, I have to say I’d never really considered it before but it seems that this year there has been a huge problem. This summer’s record temperatures seem to have brought an unwelcome visitor to households across the UK. New research by award-winning laundry and dry-cleaning start-up, Laundrapp, has revealed that almost one fifth (17%) of the population have recently experienced problems with clothes moths – that’s 8.9 million Brits with holes in their clothes! How very annoying to say the least! Of those, by far the highest number live in hot and sweaty London (36%). According to experts, this is due to London providing ideal conditions for breeding, with its mix of hot, humid days, dirt from pollution and general close living proximity. According to the research it appears that cities in the south suffer more than those in the north, with 28% of Brighton residents claiming to have experienced problems with clothes moths recently. Other southern cities are also moth spots, including Cardiff (26%) and Plymouth (19%). 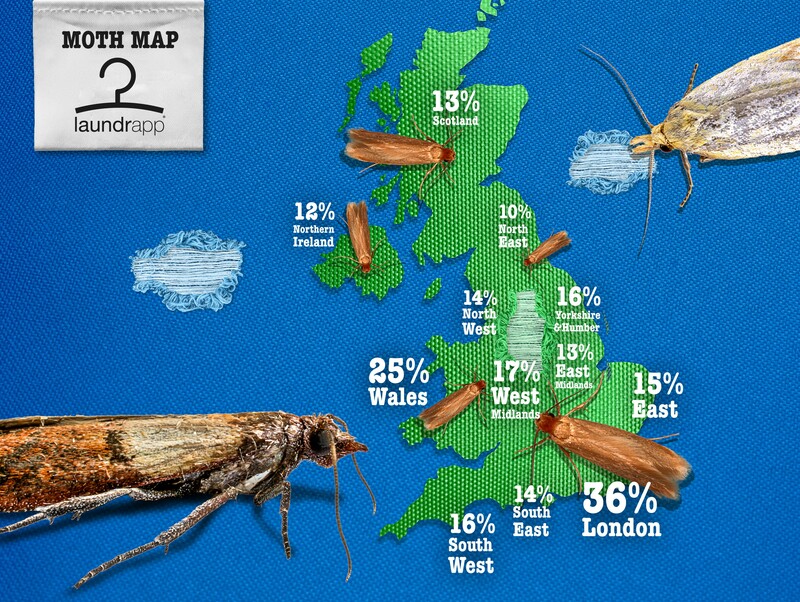 In fact, those in the North East are largely unaffected, with 90% of people in this region reporting to never have experienced a problem with clothes moths. What do they enjoy munching on the most? The little critters aren’t picky when it comes to their meals, although items with dirt, spilt food and sweat provide the moisture needed for the larvae to stay hydrated. Tops are the most commonly affected item, possibly due to their close proximity to the sweat glands, with one quarter (25%) of people claiming to have had more than five tops damaged by clothes moths in the last year. This is closely followed by shirts, jumpers and socks, with one fifth (22%) of people having more than five of each of these items damaged in the past twelve months. How can you protect your clothes? Keep your clothes clean. Avoid putting soiled clothes back in the wardrobe and make sure all your summer or winter items are dry-cleaned or laundered before they are stored. Seal your wool, silk and other natural fibres in zip-locked bags, to ensure they don’t get infested whilst stored. If you’re already infested, wash and dry clean all of your clothes and deep clean your bedroom, dressing room and wardrobes to rid the area of any larvae or lurking moths. Use natural (cedar) or pest control papers, tags or sprays available from most high street stores and keep your wardrobes cool. Moths hate the cold. Clean or spray your carpets. Don’t forget, moths and larva can lurk in carpets too. Make sure you give your carpets, curtains and fabrics like pillows, duvets and covers a regular launder. To help those affected by moths, Laundrapp is offering a discount on its laundry and dry cleaning services – simply enter the code MOTH to qualify. Laundrapp is the British startup which is revolutionising laundry and dry cleaning across the world. Launched in 2015, this award-winning app is servicing customers in over 100 towns & cities across the UK and recently launched in Australia and New Zealand with plans to expand to 15 international markets over the next 24 months. * Research conducted by CensusWide on behalf of Laundrapp, the British start-up revolutionising the laundry and dry cleaning industry with smart, on-demand, door-to-door technology. A total of 2,003 people from across the UK were surveyed from the 9th August -11th August. Have you been affected by moths? Please share your experience below in a comment. Yuk they are horrible pests! We had a wool carpet that somehow got them and it was difficult to get rid!